Stock exchange traders know what a Minsky Moment is. It’s when a market fails or falls into crisis after an extended period of market speculation or unsustainable growth. This phenomenon was named for Hyman Minsky, an economics professor famous for arguing that a long bull market tends to end in large collapse. As we live in a world dominated by a market economy, some concepts seem to apply to political life as well. If we were to consider European security after the Cold War in market terms, it was undoubtedly a bull market for Euro-Atlantic institutions, featuring a spectacular rally that more than doubled collective assets. NATO increased in value (members) from 16 to 29 points, and the EU from 12 to 28. This rise was relatively smooth, as market bears could neither break nor significantly retard this trend, although markets became increasingly heated over time. The risk of losing a most attractive asset forced bears to perform a massive market intervention, which succeeded in breaking the trend. The Minsky Moment arrived and caught the bulls by surprise, as they had become used to a linear market surge and forgot to hedge. Moreover, the fall of the market inflated previously earned assets as other market players started to doubt the sustainability of the investors who had boosted the rally. Yet the bears did not gain much either – intervention exhausted their resources as the market’s overall depreciation devalued many stocks, including the one in question. While the stock exchange analogy may be an oversimplification, especially as the “assets” are human and possess their own aspirations, this scheme can serve as an illustration of the genesis of the Ukrainian crisis. What happened in 2014 was not a sudden eruption of a geopolitical volcano, but rather the result of tectonic shifts that the bulls had seen as unavoidable, yet dismissed them as inconsequential. The fact that the collision of Russian and Western interests was formally caused by the expansion of the EU, not of NATO, was symbolic. The European Union had always claimed to have overcome old-fashioned geopolitical thinking and proposed a post-historical approach to community building in Europe. Yet the perception of their actions by others was just the opposite – a hypocritical, sophisticated disguise for traditional expansionism. The Ukrainian issue is difficult to resolve, for it transcends bilateral or even multilateral controversy. It challenges many concepts of the past – or rather, of the pasts, as there are more than one. Realpolitik’s notions from a former era – spheres of influence, buffer zones, zero-sum game – were overrun by the liberal storm touting a “Wider Europe.” Recent innovations – the win-win situation, the peaceful tearing down of borders, indispensable economic integration – born after the “end of history” were disrupted by the sudden “return of history” equipped with military force. Conflict in and over Ukraine raised a few conceptual questions. What does it mean today to build a de-facto new nation state, especially in light of historically and culturally diverse territories? Are nationalism and democracy still compatible? What are the limits for an alliance’s capacity to absorb new members? Beyond full membership, what security guarantees can be applied to satisfy everyone and provoke no one? What does sovereignty mean in an interdependent globalized world? The Minsk Protocol is still considered the only hope for a way out of the Ukrainian impasse. 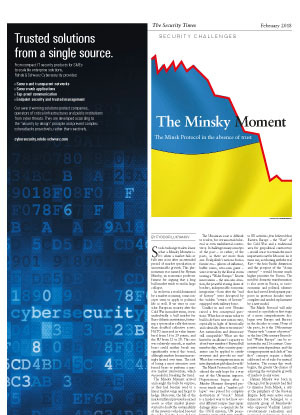 Negotiations began after a Minsky Moment disrupted previous trends and a “market collapse” was poised for complete destruction of “stock.” Minsk is a modest way to test how several different recipes may repair damage done – a special role for the OSCE mission, UN peacekeeping units with very specific functions, modalities for supervisors imposing obligations on the parties in conflict. All are crucial measures to gradually stabilize this severe standoff. As the Ukrainian conflict is the quintessence of problems accumulated over decades between major international players, a final settlement is not possible without a comprehensive agreement on a new European framework, not only in terms of security, but addressing a broader, more comprehensive realignment of all actors. No group or state is in the position it expected to find itself in years ago. Russia, the EU, NATO, the US, key states in Europe – all have undergone painful internal transformations, and have had difficulties adapting to a world changing at an ever-faster pace. When the EU pushed for association agreements with the Eastern Partnership countries, no one predicted the migration crisis, the meltdown of major political parties across Europe or the brittle transatlantic relations in the wake of the political earthquake in the US. When Russia fiercely responded to EU activities, few believed that Eastern Europe – the “East” of the Cold War and a traditional area for geopolitical controversy – would cease to remain the most important issue for Moscow. As it turns out, a reckoning with the real East – the Asia-Pacific dimension and the prospect of the “Asian century” – would become much higher priorities for Russia. The need for domestic transformation is also acute in Russia, as socio-economic and political schemes that had served development purposes in previous decades were complete and needed replacement by a new model. The Minsk Protocol will only succeed as a prelude or first stage of a more comprehensive dialogue over Europe and Eurasia in the decades to come. None of the pasts, be it the 19th-century Vienna-style “concert of powers” or the late-20th-century Brussels-led “Wider Europe” can be re-instated in our 21st century. Competitive interdependence and the rising propensity and clash of “me first” concepts require a finely calibrated set of rules for mutual behavior. The sooner this work begins, the greater the chance of achieving the sustainable growth of markets in any sense. Hyman Minsky was born in Chicago, but his parents had fled to America from Minsk, a city at the periphery of the Russian Empire. Both were active social democrats but belonged to a minority group of Mensheviks who opposed Vladimir Lenin’s revolutionary radicalism and promoted evolutionary changes in a European style. Lenin’s Bolsheviks prevailed and Russia embarked on its tragic path through the 20th century. Lenin’s most hated denizen of Europe’s social democrat scene was Berlin SPD politician Eduard Bernstein, who said that movement is everything, but the final goal nothing. But what would a final goal look like in Ukraine? This is not to say that the negotiations based on Minsk Protocol should proceed indefinitely through its various stages, but rather that in the contemporary world, movement is more critical than the endgame. This is especially true in light of the fatal deficit of trust among the key players; for, trust is a critical element everywhere – on Wall Street as well as in geostrategic talks. is editor-in-chief of Russia in Global Affairs and chairman of the Presidium of the Council for Foreign and Defense Policy in Moscow.